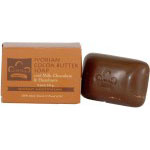 Combines nutrient-rich Cocoa Butter with Shea Butter, Vitamin E, and Oatmeal extracts. Enhanced with a touch of Milk Chocolate with shredded Hazelnuts for exfoliation of dead skin cells. Qty: 6 pack - 5oz bars.